Fighting back against option paralysis and the fragmentation of daily life. November 20th 2013: Tim Gerwing, co-founding member of 30 Days, has released “Scorpius Rising”, aka Music for the Inner Listener 5. This is Tim’s 5th solo album and includes many tracks which originated in previous 30 Days projects. Copies of the album are available from Tim directly as MP3 or hard copy starting tomorrow (Friday November 22nd). It will be available on iTunes, Emusic, Amazon, and many others soon. We’re showing our work in Vancouver. Any Thirty Days Project participants, followers and fans who live near Vancouver, come and see our show! 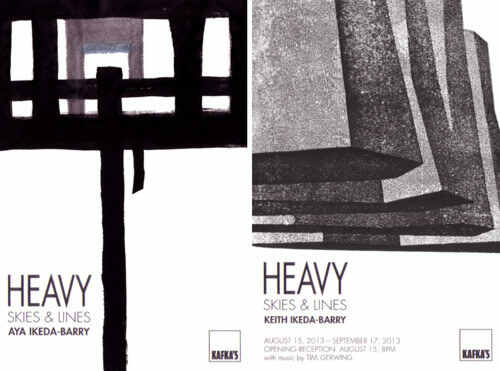 My pieces are all large-scale woodblock-style prints based on the “heavy sky” series I did during Thirty Days Project last November. Aya’s pieces are large, abstract works based on explorations from her Thirty Days Project work. We would love to see any of you at our opening event on Thursday night, from 8pm, at Kafka’s Coffee and Tea, 2525 Main Street at Broadway. Aya is doing her magic catering and Tim Gerwing will be playing his own amazing music, much of which will be based on his own Thirty Days Project work. Posted in Announcements | Comments Off on We’re showing our work in Vancouver. DAY 29 – someone isn’t cooperating for the photo. Put yer glasses on! Posted in Daily Work, June 2013 | Comments Off on DAY 29 – someone isn’t cooperating for the photo. Put yer glasses on! DAY 28 – 1990’s rocker with a mullett or snuffleupagus – you decide! Posted in Daily Work, June 2013 | Comments Off on DAY 28 – 1990’s rocker with a mullett or snuffleupagus – you decide! Congratulations to everyone for their work in 30 Days June 2013. A special congratulations to everyone that completed a piece of work per day. Please visit www.lascaux21.com/library to hear my 30 Days work from this year and years past. I’m looking forward to seeing you all again for the next 30 Days, which is going to be very special as it’s officially our 10th iteration. In the meantime, I hope many of you will put together shows/websites/collections of your work. Make sure to tell us about them! Thirty Days Project, June 2013: Done! Congratulations to all participants on another Thirty Days Project completed! We hope you look back on the past month of work and feel rewarded. What had to change in your life to let you finish a new piece every day? Do you miss the things that you had to leave behind? What does this collection of thirty new pieces mean to you? The next Thirty Days Project will be in April, 2014. It will be the TENTH iteration, and we have some big plans. Mark your calendars and challenge your friends and colleagues to join you in Thirty Days of relentless creative output. If you know any artists or anyone who might benefit from thirty days of structured work, be sure to send them a link to this site. Remember to keep us posted about any shows or collections of your work. Posted in Announcements | Comments Off on Thirty Days Project, June 2013: Done! WOO!! Last one gets a little meta! Yesterday’s piece was a warm-up for this large, complex one. It is twice the size of the other paintings I did this past month, and working on it took up most of the day. Please click the image to see it at a larger, more reasonable size. 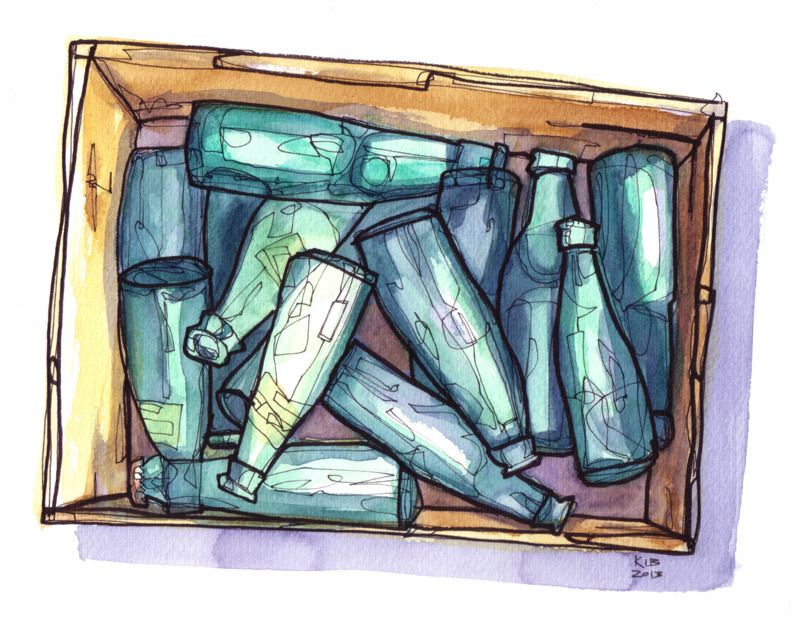 I was happy with how the thin linework represented an expression of the reflections and translucency of the bottles. These lines became an integral part of the style that slowly developed. 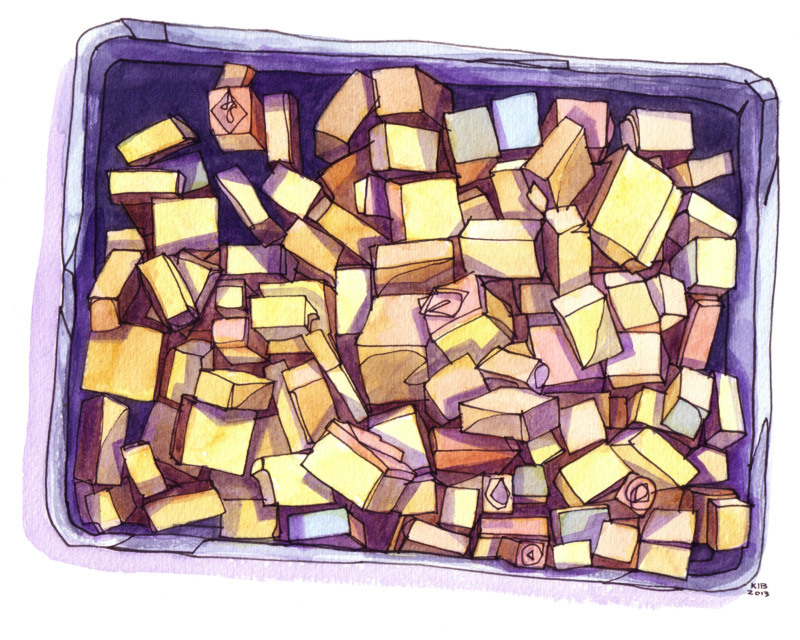 Watercolours are so fickle. This time I felt I got some of the complementary yellows and purples to show a little vibrancy in some places instead of descending into muddy dullness. I tried to do this again later, with some failure (Days 09, 12, 14, etc) and some success (Days 05, 26). It was satisfying to push the style that I had been developing through a self-imposed limit of only two main colours (Burnt Sienna and Payne’s Grey). Congratulations to all Thirty Days Participants! Another great month of work! wow! on your final piece. This is so sweet, I squealed. I wanted to create a “New York school of minimalism” piece that would sound like something you would hear in a brick warehouse art space and have strong emotional impact. I’d also been reading some articles about the cult of Pythagoras, and how 5 was a very important number in that line of thinking. So, I made a piece in 5 with a bass line in 3, then the violin solo basically in 2 or 4 depending how you hear it. The thematic elements repeat at different rates and weave in an out of each other’s way, sometimes harmonzing, and always re-contextualizing each other. Once I had all that in place, the title appeared by itself. Did anyone recognize this melody? 🙂 I had decided to riff on some JS Bach, and I really enjoyed playing the melody in rapidly switching un-related keys. For example, I start in C major but jump quite quickly to A Flat Major – one shared note, but not related keys at all. The shifts in keys really felt like they were suggesting themselves and I tried to follow that as much as possible. I must confess, though, that I edited this a lot and made many mistakes along the way. There were a number of passages where I performed very sloppily but I just kept going with the improvisation, then went back later to listen to and memorize what I’d done, and replayed it more cleanly. What a huge difference there is between improv and “performance” of this sort. I often find that I really can’t perform something that I was able to improvise because I’m much more carefree when “noodling”. For me, one of the biggest lessons in this 30 Days was in allowing myself to just “play” more. I allowed myself to just “noodle around” while avoiding critical judgement as much as possible, all the while secretly knowing I would be recording and re-working the material later. It is so interesting to read about what goes into your music. I feel that no matter how much I enjoy listening to them, I’m never really getting all I should/could without knowing all the background info. Really glad you wrote these three explanations. I’d love to read the other 27, too. 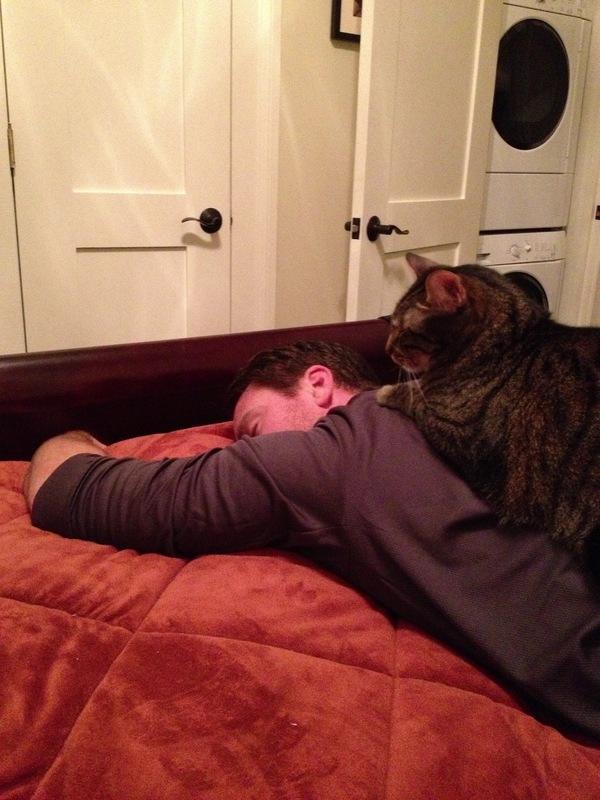 This week’s photo challenge was to explore companionship. My boyfriend and my younger cat, Munky, are best friends. They do everything together; Munky basically ignores me, even though I’m the one with the food, treats & toys. He’s just head-over-heels in love with his best dude, and it’s kind of awesome. 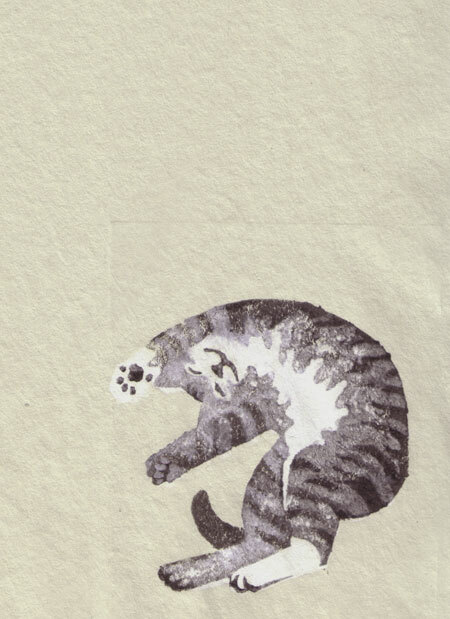 I find the whole idea rather tedious – living forever sounds like a drag! But if I did, here’s the plan. day 30. my sweet jessie, who I borrow, walk and love ! Posted in Daily Work, June 2013 | Comments Off on day 30. my sweet jessie, who I borrow, walk and love ! It was a challenge to keep the practice of a daily project going while on the go. Traveling today is more complex than ever before. Air travel has its surreal moments; it used to be about fear of flying, but now it’s about a strange sense of security and inconvenience. For two weeks, I was in New York, and for the most part, NYC is all about transit: catching the subway, snaking thru traffic, negotiating congested streets and sidewalks. It’s noisy, chaotic and anonymous 24/7. My artist practice is primarily photography and ceramics with the occasional bookarts project. I do value the importance of drawing because it is about seeing, a discipline I value even more now that art school is over. It would have been easy to use my iPhone and upload photos everyday, but I kinda did that in May 2012 when I went back East for a family reunion/memorial service. It’s way too easy for me to work in a digital environment, so picking up a pencil everyday was what I signed up for. Somedays, drawing comes easy and other days, well we all have those days. I can’t really answer Tim’s challenge questions directly, but I can spin off of them. The results of two drawings surprised me: Malachite and It’s a Wrap. Malachite is the more satisfying of the two, and if you look closely , Wrap is trying just a little two hard. And, while I’m at it, I was pretty pleased with that little yellow banana that sat on the table for a few days growing freckles. I inched my way thru drawing classes in art school by splashing colour into unexpected places, often to disguise technical flaws; then it became a bit of a style. Any comments for me? I agree, Phyllis, that Malachite piece is excellent. Great work (again!). 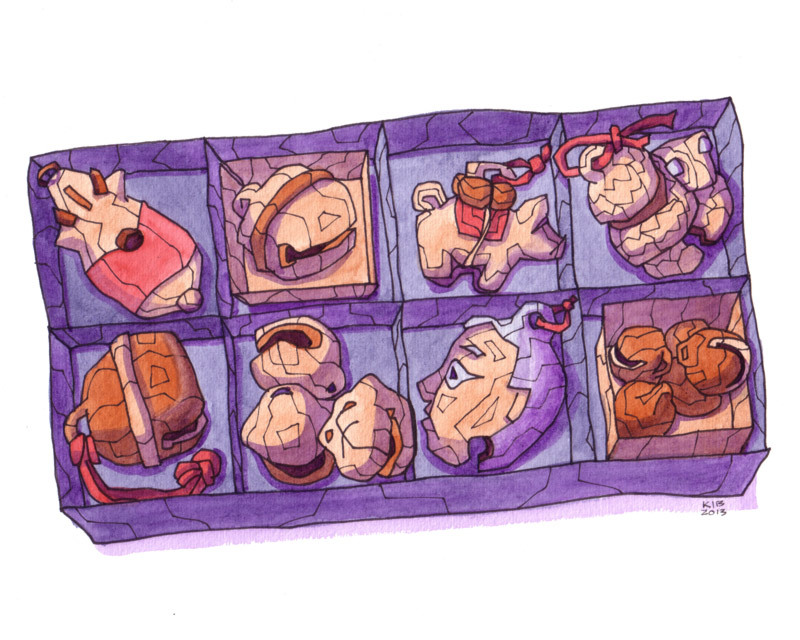 30 days later: attempted to draw something, somewhere, sometime everyday while traveling most of those days. Challenging to say the least. What Is Thirty Days Project? All work linked or displayed here is copyright protected. Do not link to or use any material without permission from its creator.